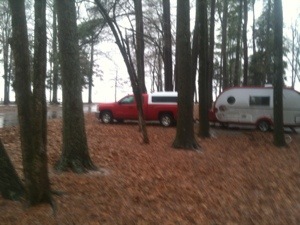 Our forlorn rig in the freezing rain with Lake Ashtabuta in the near distance. 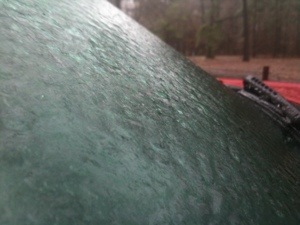 That’s what every surface above ground looks like — covered with 1/4″ of ice. 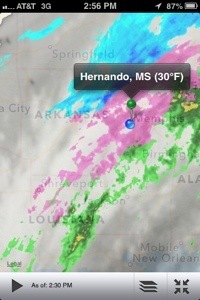 And here’s what the radar looks like at 3 pm. More coming. We’re inside mainly. And we’ll be ok as long as the electricity and propane hold out. If I’d of known we’d be frozen in, I’d of replaced that propane cylinder which is almost gone. We do have our stand-by 8 pounder tho. Planning on needing the remote starter to get onto our truck tomorrow. If no further posts remember Herbando Pt campground lot 15. Bring ice chisels and brandy. Lots of brandy. John. Yikes!!! I thought you were in the warm South! That’s CRAZY! Hope you get out soon. Keep thinking sunshine and warmth. Maybe it will help melt the ice. As far south as you are, it shouldn’t last long–at least we hope not. Keep cuddling to stay warm. Dang.. not to rub it in, but there’s no ice or snow here in GR…. it is a bit chilly though. Hope you brought plenty of books and games and puzzles. Wish you hadn’t left here for the bull fights. Sounds like some of our trips only worse. It’s cold here but no ice!